It was a sarcastic statement, cloaked and swathed in arrogance-made by none other than Oommen Chandy, ruler of the sacred land reclaimed by Parasurama. The words were a menacing challenge even to Lord Parthasarathy Temple consecrated by Arjuna, the Pandava prince. â€œIf the earth and sky have their existence, Aranmula will have its airport. Prime Minister Narendra Modi will lay the foundation tooâ€â€¦ there was no dearth to those boasting oozing of over confidence. But look where they are now, having fallen flat on their nose!! Narendra Modi government gave a befitting reply to those who had staunchly believed that wine and wealth could but anyone- they did prove that this time, the government at the Centre was indeed different. It was only two years back that the promoters of Greenfield Airport and its political supporters basked in the glory of UPA rule, quite convinced that they would stifle the remonstration of the masses. In all those fraudulent ways adopted, they even managed to get a few lines related to the airport squeezed into the Presidential address in 2013. But that was what made the Aranmula Paithrukagrama Karma Samiti realize that KGS and their fraudulent ways were crossing all limits of human sanity. The seer that he is, Kummanam Rajashekharan, in whom the Kerala society had proffered their trust, had foreseen the land mafiaâ€™s devious airport plans and the volley of perils that it would usher in. 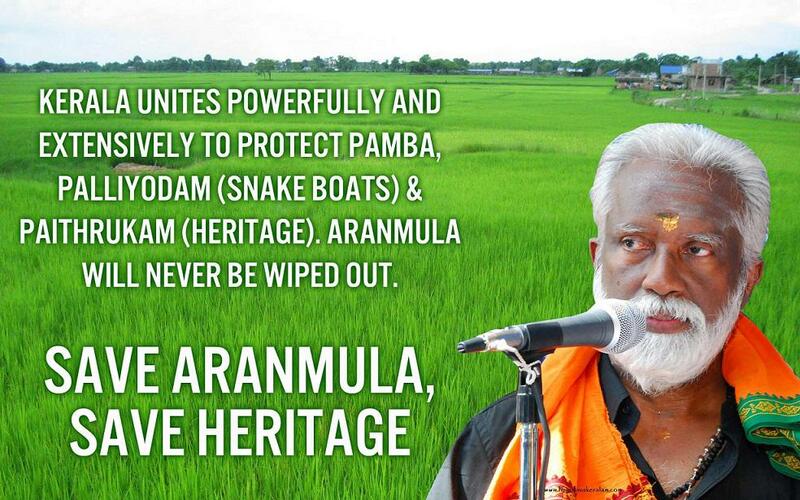 And from thence was an endeavour, so relentless, untiring and selfless in nature, all aimed at liberation of Aranmula from the clutches those tyrannical hands. As expected, intimidations arrived in leaps and bounds. But armed with that naturally bestowed disarming smile, Kummanam forged ahead undaunted. Society stood united as one, forgetting all divisive barriers like caste and political ideologies. When government authorities chose to neglect every single plea made by citizens about what they stood to lose- their water bodies, paddy fields and even their right to worship! But residents of the culturally affluent Aranmula were not the kind to give up and with the majority of Kerala standing by to support them; an anti-airport stand was firmly taken. KGS too did not resolve to give up the race and with money power and appeasement lavishly bestowed wherever it was required, they, along with the state governmentâ€™s support managed to procure permissions related to the same. Arjuna is said to have consecrated the temple of Lord Parthasarathy at Aranmula as part of a long penance to atone for the sin of having slain Karna. With plans being sketched galore by KGS for an airport, even the position and height of the â€˜kodimaramâ€™ or holy mast of the temple, stood at a risk. But the calamity was averted. But those who were duty bound knew that these would never stand on the permanent pedestal of victory in the land that basked in the grace and blessings of Lord Parthasarathy, who was instrumental in defeating the Kaurava army. And soon, the long saga of remonstrations took a turn towards virtue. And then came the Court order, directing KGS to restore nature in its pristine form, before they embarked on their ravishing saga. Other directives included segregation of the 232 acres of surplus land among the landless and homeless, reinstating of those collectors and deputy collectors, justice toÂ who were transferred owing to their non-cooperation in the governmentâ€™s fraudulent ways, along with an apology to them and justice to those revenue officers who were unjustly transferred, revealing of the names of those who received money from KGS etc. The victory secured by Aranmula remonstration is a perfect example of how truth finally triumphs. Kerala, which has always stood mute witness to compromises, finally saw how truth eternally triumphs over deceit and falsehood. But it is well understood how truth and justice do not toe in the lines of those who stand defeated. They will not hesitate to weave yet another of their devious ploys to have their ways. And for the same reason,we need to keep eternal vigil against their dubious games. These were the words our Chandi CM uttered for the appeasement of KGS group. Pranam to Kummanamji and other scores of people participated in the agitation. Central Govt. also came to know about the fraud lately and withdrawn the ‘in principal clearance’ earlier granted by them. Shri Jhavdekar also deserve our appreciation for the just action. Once again pranams to Kummanamji and others who participated in this ‘no to airport’ agitation.